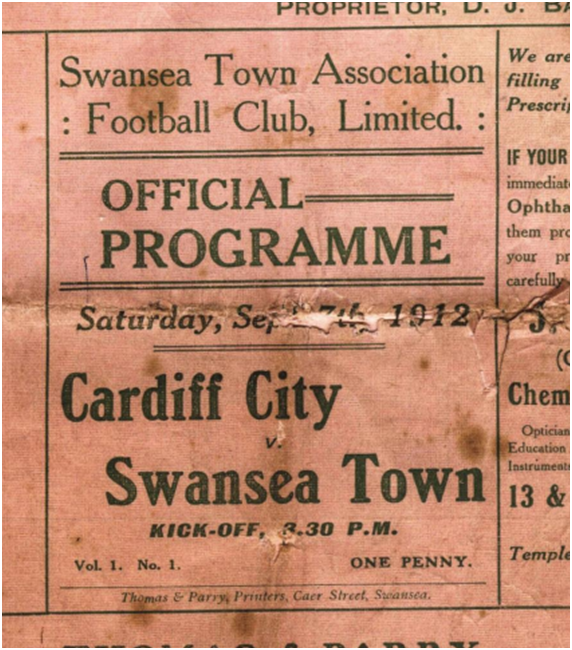 In 1912, Swansea Town played its first ever professional match, a Southern League game against Cardiff City. Although 12,000 people attended the 1-1 draw, it was a match that drew very little attention in the wider world. Professional football was still in its infancy and new clubs were being set up across the UK. There was no guarantee that any of them would last. But last they did and, after the Great War, football’s popularity in south Wales soared. Cardiff and Swansea both joined the Football League and Cardiff quickly rose to its first division, becoming one of the most famous clubs in Britain. Its elevation meant derbies were not common but 1929 saw Cardiff slip out of the first division, bringing the first Football League match between the two clubs. Special trains and buses were put on to the game from across south Wales. Such was the interest that Merthyr Town even rearranged a match to avoid a clash. The game mattered to Swansea more. In 1925, the Swansea chairman had suggested that a league match between the two clubs might help decide the ‘vexed question’ of the capital of Wales. Although it was not until 1955 that Cardiff was officially declared the capital, Swansea still felt in the shadow of its larger neighbour, especially since Cardiff was a city and Swansea was not. Moreover, there was some feeling that Cardiff’s claim to capital status was unfair because the city was more anglicized than Swansea. Football matches between the two clubs thus offered the Swans the opportunity to prove their equality with their larger neighbour. Cardiff’s lesser interest in the derby was illustrated by a 1925 fifth-round Welsh Cup match between the two. Feeling the league and its imminent FA Cup final more important, Cardiff City appeared to deliberately play badly, indulging in, according to one Swansea newspaper, ‘childish methods’ and ‘pompous swank’. Despite winning 4-0, Swansea Town had missed out on an opportunity to secure a meaningful victory over its rival and its supporters felt insulted. The proximity of the two clubs did, however, mean attendances at the derby were very high. In 1949, there were 60,855 at NinianPark for a Division 2 match between the two teams, a record for the derby that will probably never be broken. Fans remember the derbies of the 1940s and 50s as having a friendly atmosphere. There was certainly banter between the unsegregated supporters but nothing worse. Indeed, both sets of fans were happy to see the other do well, bound by a common south Walian identity. Some supporters, particularly those who lived somewhere between Cardiff and Swansea, were also willing to pay to see whichever of the two clubs had the most attractive fixtures or was playing the best football. In 1952, the Swansea Town manager asked the league if home games could be scheduled when first-division Cardiff City were playing away. He feared Swans fans would prefer watching the better standard of football forty miles away. A hint of a more bitter rivalry emerged in 1960, when Cardiff, angry at the scheduling of the match, fielded a reserve side for a Welsh Cup fixture between the two teams. This brought a 350 guinea fine and a rebuke from the Football Association of Wales, who told the capital’s club to show the competition more respect. Swansea’s directors were also insulted by their Cardiff counterparts refusing to join them in the boardroom. It was a bad tempered match that saw three players sent off. Football crowds were in decline by this time. Standing on a cold terrace was less appealing than watching television, doing DIY or taking the family out for a spin, all pursuits enabled by the new post-war working-class affluence. Many family men thus stopped going to matches. Crowds grew younger and began to take on the characteristics of the modern youth culture that emerged in the 1950s. With their confidence and opportunities boosted by rising wages and near full employment, boys and men in their teens and early twenties travelled to away matches in large numbers, adopted fashions that made them stand out, drank more than earlier generations and acted more aggressively. The result was that fighting, swearing and obscene chanting all became relatively common at football matches in the 1960s and the sport gave young men a fun outlet for proving their masculinity. Alongside these changes, patterns of regional support declined. This was a reaction to the rise of the televised game and more affordable travel, which both contributed to the biggest clubs drawing more and more supporters from outside their traditional catchment areas. For younger supporters who stayed with their local teams, there appears to have been resentment about people following other teams and regional rivalries began to replace regional identities. The relationship between the two sets of fans thus changed and many began wanting their local rivals to lose. By 1969, this had spilled over into the first crowd trouble at the south Wales derby. In a two-leg Welsh Cup final, Cardiff fans vandalised a train on their return home and then, at the second leg at Ninian Park, they attacked two coaches carrying Swansea fans, smashing windows and denting the sides. There was no league derby between the two sides between 1965 and 1980 and that held back the derby from becoming too embroiled in the growing football hooligan culture. But the 1980 derby inevitably saw trouble and two weeks later fans clashed again after a bizarre decision to hold an FA Cup replay between Swansea and Crystal Palace at Ninian Park. There was considerable fighting on the terraces between Swansea supporters and Cardiff fans who had either turned up to see the match or perhaps just to enjoy a scuffle. The low point came outside the ground when a Swansea fan was stabbed to death in a fight with Palace supporters. It was the 1980s that really saw the tensions intensify. Football hooliganism was peaking everywhere in Britain and south Wales was no different. Cardiff fans, however, had a new reason to dislike their neighbours down the M4. In 1981, Swansea were promoted to the first division and their manager was John Toshack, a former Cardiff City cult hero. This created not just jealousy but a feeling that the natural order of things had been turned upside down. In a derby in Swansea’s promotion season, their fans threw bricks at cars and houses. At the 1982 Welsh Cup final, it was golf balls that were exchanged between the two fans and a policeman was hospitalized by a dart. As both clubs fell on hard times, the extent of the rivalry became something of a badge of honour. Some fans looked at it as something that put their teams on the map. They might not be able to compete with the big boys on the pitch but south Wales had a derby to rival anywhere. It was gaining its own legends and language too. Swansea fans became ‘Gypos’, in reference to the perceived poverty of Wales’s second city. Cardiff fans were greeted by breast-stroking players and supporters who sang ‘swimaway, swimaway’, a reference to a group of teenage Cardiff fans being chased into the sea at a 1988 derby. The climax of trouble came at the 1993 ‘Battle of Ninian Park’. Swansea fans ripped up seats and hurled them at rival fans, which prompted a pitch invasion. Mounted police and dogs had to clear the pitch and control the situation. The game was delayed by forty minutes, eight fans were hospitalized and nine were arrested. The result of the new determination to do something was the banning of away fans from the fixture. 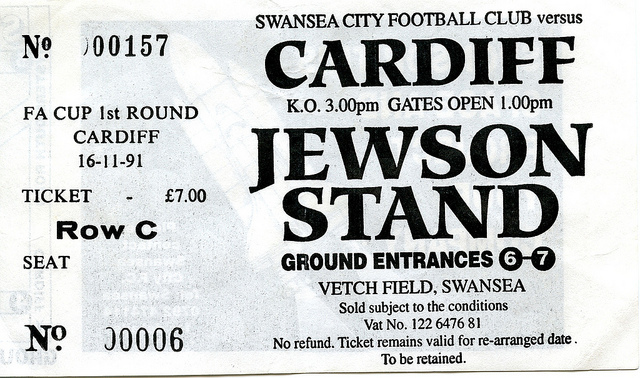 But the damage had been done and the next time the two clubs met in 1994, just 3,711 turned up to the Vetch. For many supporters, the derby had become something to avoid rather than get excited about. Although hooliganism was a problem at most clubs, and Welsh fans were certainly playing up to the expectations of the time, there were some unique factors to the south Wales derby. In Swansea, there was some feeling that the BBC was too Cardiff-centric and that the club’s rise up through the divisions had not been given adequate coverage. Accusations of a Welsh media bias towards the capital grew and extended from the BBC to HTV Wales and the Western Mail. The size, extent and placing of coverage were all carefully scrutinized and Swansea fans could be quick to take offence at both real and imagined inequalities. The regeneration of Cardiff Bay in the 1990s, funded by millions of pounds of central government money, threw another source of resentment into the mix. There was little surprise when the National Assembly was located in the capital but there was bitterness over how Swansea had been given the impression that it could win a farce of a competition over where to locate the new home of Welsh democracy. Things did get better. Hooliganism went out of fashion. Policing and stewarding became better organised and managed. Both clubs got new all-seater stadiums that were closely monitored by CCTV. It was easier to identify troublemakers but people were also simply less likely to cause problems if they were sitting down. When away fans returned to the fixture in 1997, they were herded in and out of the ground in police-escorted convoys. There was little opportunity to get anywhere near a rival fan, although that did not stop some vandalism of their rivals’ stadium or a few minor skirmishes with police. Of course, not all fans have shared in the hatred. There were many on both sides who saw it as a bit childish or who were quite happy to see a fellow Welsh team doing well. Many Swansea fans have certainly welcomed Cardiff’s promotion to Premier League because it was an opportunity to have a derby again. There is even at least one person who has season tickets for both clubs. Saturday’s derby will be a long way removed from the first match between the two clubs in 1912. The audience will be global and the atmosphere far more hostile. No doubt there will be some songs sung and gestures made that would shock the supporter of a hundred years ago and will confuse the modern foreign audiences watching. But, however much local pride is at stake, one thing hasn’t changed. You do not get more points for beating your neighbour than you do for beating any other team in the division. In that sense at least, even if in no other, it’s just another game. A letter from a Cardiff City fan to the South Wales Echo (3 Dec. 1927) that the club’s present ownership would do well to think about. A letter to the South Wales Echo (23 Feb. 1922) that the owners of all clubs would do well to think about. Taken from Martin Johnes, Soccer & Society, 1900-39 (University of Wales Press, 2002).